If you want an idea of how Carnival is in Venice, the only way would be to experience it first-hand. Near the second half of February, the atmosphere in the lagoon begins to heat up; there’s electricity in the air. The sleepy winter air in Venice starts to give way to new dynamic and brazen days of Carnival. The schedule of parties and events, as always, even for Carnival in Venice 2019 is rich of happenings. There are public events that are free and crowded especially near Saint Mark’s square. There are exclusive parties-super private-in some of the most beautiful palaces of the city; and then there are perfect moments of unplanned fun in some of the alleys and campielli throughout the city making it a perfect way to visit different parts or angles hidden in the city especially with its characteristic bacari. 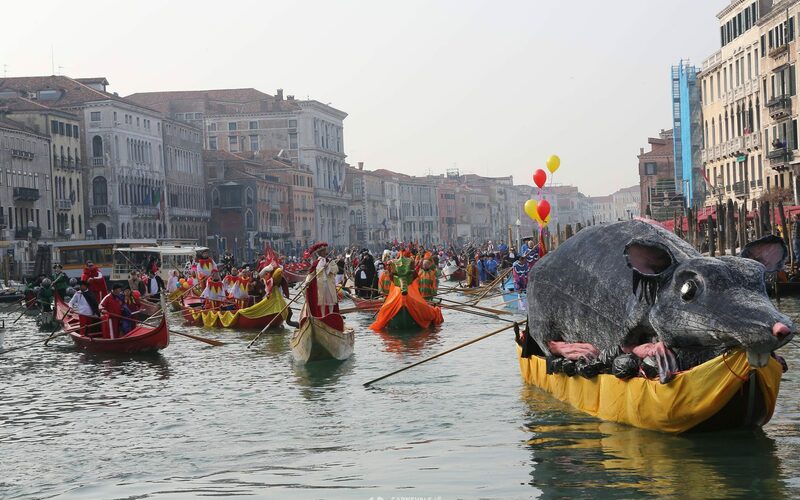 Venice’s Carnival will officially open the 16th of February with the Festa Veneziana sull’Acqua, now a traditional parade of allegoric boats and artists with the incredible background of Rio di Cannaregio. Saturday the 23rd of February on Saint Mark’s stage there will be the presentation of the 12 Marie chosen for 2019 edition, the Ballad and the decapitation of the bull is set to take place on the “fat” Thursday the 28th of February and the “Signori della Notte” (Gentleman of the Night) will put order in the old brawls between Nocoletti and Castellani the “fat” Friday on the 1st of March. Sunday the 24th of February and Sunday March 2nd there will the traditional flights from the Saint Mark’s Bell Tower. This year there is the most requested flight of the Angel and added is the flight of the Warrior that debuts this year. Sunday the 2nd of March there will be the flight of the Eagle, which t for many years now has been done by a celebrity of our time. The Carnival in Saint Mark’s Square will conclude Tuesday March 5th with the traditional flight of the Lion.